There is a huge debate these days about whether to go traditional and put shoes on your horse, or leave them au naturel, barefoot and free. After all, horses in the wild don’t have shoes and they do just fine, right? So why do we even shoe them at all? Domesticated horses do a lot of things that wild horses do not. They bear extra weight; they travel over rougher surfaces, such as asphalt. They work for us, whether in a field, on a trail or in a rodeo arena. It makes sense to give them some extra protection. However, more and more people are coming to believe that horses can do all those things barefoot, and many experts agree. If you practice proper hoof care, have the hooves trimmed regularly, and provide any dietary supplements you, your farrier and your vet decide may be necessary, most horses can go barefoot with no problem. When we got Valentine, he was shod, except for his right rear where he had lost one (or “thrown a shoe” as they say). That hoof was so nicked up, and he was so sensitive on that foot, that we didn’t think it was a good idea for him to go bare. When we got Moonshine, she was barefoot all around and had been for some time. Her feet were pretty nicked up too, but the previous owner said she hadn’t had a trim for a while. The farrier said her feet looked really good, so we left her barefoot and just had her trimmed. 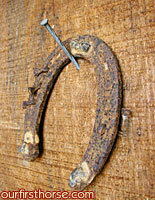 Horses’ hooves grow continuously, much like our fingernails. Even if your horse is shod, and hasn’t managed to lose any of his shoes, you should have your farrier out every six to eight weeks to trim the hooves and re-shoe. Somehow we managed to put it off for three months this time. We finally got the farrier out yesterday. Moonshine’s feet were all beat up, and Valentine had lost both his front shoes. Our pasture is not all soft grass – it’s wooded in a couple of places, and pretty rocky in a few places too. We decided to go ahead and put shoes on Moonshine. As it turns out, she would have needed shoes this time anyway, because she managed to cut her left rear foot pretty badly the night before – right at the back outside edge of the hoof, it’s split up to the hair line, about an inch and a half long. The farrier says it’s not as bad as it looks (good thing! ), and if we keep her her stall for a few days and keep the wound clean and medicated for a few days, it will be fine. Of course, with shoes on, that kind of injury is much less likely to occur. There are pros and cons for each side. When you’re deciding whether or not to shoe your horse, discuss it with your farrier and your veterinarian and decide what is best for your horse based on his environment, lifestyle and hoof condition – and temperament. When we decided to keep Moonshine barefoot back in May, our farrier said about Valentine, “Yep, you’re going to have to keep his shoes on. He was such a baby about that one bare foot.” And it’s true. His hooves are fine, and in fact held up better than hers after he threw those front shoes, but he just hates to be barefoot. Hey, everybody has their issues.